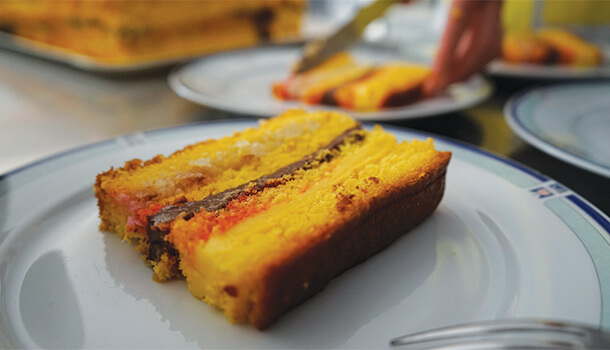 Layered sponge cake recipe known as Pizza Dolce from the region of Abruzzo. 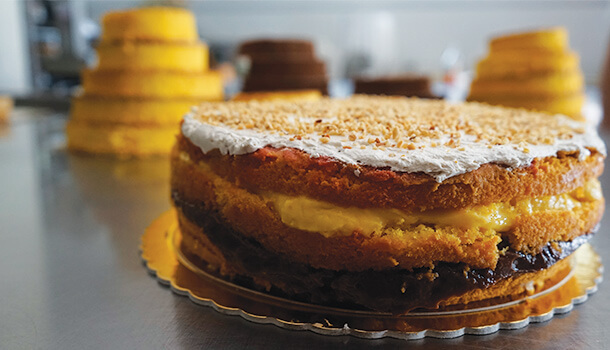 Originating back to 1923, this layered sponge cake has evolved over time to become one of the most sought after organic sponge cake desserts in Italy. 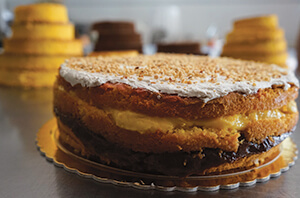 This layered sponge cake is a sweet mix of sponge layered with almonds, vanilla and chocolate custard topped with coffee icing and super moist thanks to the mix of liquors on every layer. It’s a flavour bomb and should be enjoyed responsibly. Preheat your oven to 150 degrees celcius (302F). Mix 5 x eggs with 150g white sugar using a kitchen aid or electric mixer. Cover a large cake pan with butter and flour to prevent the cake from sticking to it once it is baking in the oven. Pour the sponge cake mix into the pan and place this in the oven for around. 2 hours. Place 400g sugar into a mixing bowl and add 100g of plain flour. Mix using your hands to get rid of any lumps. Transfer this into a saucepan and add 1 litre of fresh milk and 8 egg yolks. Mix this together really well using a whisk. Add a slice of lemon rind, then the cinnamon and vanilla. Mix gently, then put your saucepan on the stove at a medium heat and mix continuously using a wooden spoon. It should take between 5-10 minutes to become thick and creamy. Remove half of the cream from the saucepan and transfer it into a bowl to cool and set. Add 100g (or more if you like!) of dark chocolate melting buds and mix well. Continue to mix until the cream has changed in colour and then remove it from the stove to cool and set also. This is a mix of almonds, sugar, pure vanilla, lemon and Amaretto (or Frangelico). Mix one kilo of room temperature organic butter with 100g of sugar and combine using an electric mixer or a kitchen aid. Add 2 cups of espresso coffee and continue to mix through. The icing should start to thicken up. Continue to mix until you are happy with the consistency. 6. 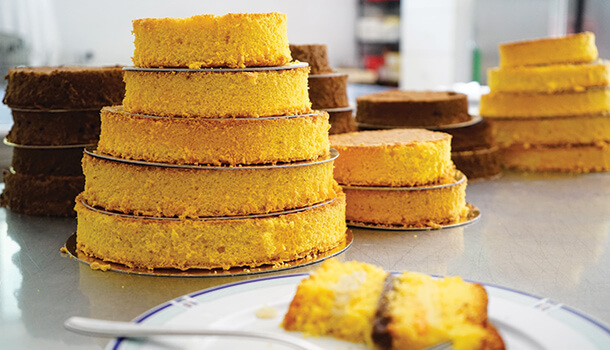 Add the third layer of moist sponge cake to the top and repeat step 3 once again. Then spread the vanilla custard on top – again be as generous as you like! Using a flat spatula, scoop up a generous amount of Mocha icing and lather it on top of your Pizza Dolce layered cake. You should use a back and forth motion with your hand to spread the mocha icing evenly over the top. Sprinkle a liberal amount of crushed hazelnuts over the top of the icing and leave the cake to rest. Your Pizza Dolce layered sponge cake should rest in the fridge for 24-48hr for best results. When you eat this cake you will be enjoying a slice of Abruzzo’s history so take a moment to say thanks for this ridiculously yummy TREAT! VINCENZO’S PLATE TIP: This cake has nothing to do with a pizza except for the fact the colours mirror those on a pizza which is where the name originated!